From the Baldwin County Courthouse, go west on Hancock St. which becomes Highway 49 and follow Highway 49 south for 3.3 miles from the Courthouse. Turn left at Allen Memorial Drive. Proceed about 0.6 of a mile until you come to Shana Drive on the right. Go past Shana Drive to the third house at 159 Allen Memorial Drive. The cemetery is in the woods about 250 feet behind the house or about 400 feet from Allen Memorial Drive. It is on the edge of the Big Gully. On Tax Map 59, Parcel 25. 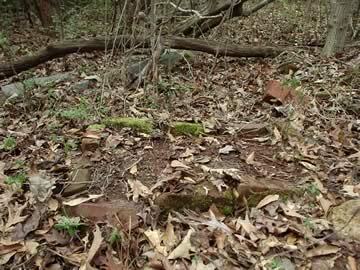 Scattered bricks indicate a grave.